“ Thug: Where are you?! Batman is a superhero from DC Comics. He previously fought Spider-Man in the 23rd episode of Death Battle, Batman VS Spider-Man, he later fought Captain America in the 36th episode of Death Battle, Batman VS Captain America, and fought Black Panther in the 88th episode of Death Battle, Black Panther VS Batman. He also fought Albert Wesker in an episode of One Minute Melee and later fought Iron Man in another. He then fought Scorpion in an episode of DBX. The Batman Who Laughs VS. Superior Spider-Man. Has had 23 girlfriends. Kissed at least 60 women. A repurposed Nomex survival suit, it was designed to evoke fear. These blades can slice through metal, block swords or be fired like bullets. B.A.T. System dampens and absorbs kinetic energy and can release it on command. A exo-suit that Batman developed to not only fight Superman on equal footing, but also to compensate for the physical limitations that came with his aging. Normally paired with a kryptonite weapon, like kryptonite gas launcher and kryptonite spear. In its original appearance it was still taken apart relatively easily, even while Superman had restraint. But Batman merely used the armor to prolong the duel long enough for Green Arrow to ambush Superman with a kryptonite arrow. Batman became one of the New Gods; He is the God of Knowledge. It's Batman, but God. Need any more be said? Kryptonite Gas Grenade Launcher: Temprarily weakens Kryptonians for only a few minutes. Kryptonite Spear: unlike his other kryptonite weapons; is specifically designed to be lethal. Gold Kryptonite: is capable of permanently de-powering Kryptonians. Gold Kryptonite Knife: Injustice Batman used this weapon in an attempt to remove Injustice Superman's powers. Similarly designed to the grapple gun. Used to pull objects/foes towards Batman. Can be applied in non-lethal doses against enemies. Mostly used to destroy weak surfaces and to open pathways. Used to pilot the Batmobile from a distance. Disables machines, electronic devices, vehicles or firearms. Carries up to four charges. Can act as an improvised defibrillator. Gains power via kinetic energy. Given to Batman by Mr. Freeze in Arkham City. Can be thrown as a proximity mine. Can create ice rafts for Batman to traverse water. Capable of overloading electrical power sources. Can fire negative and positive charges to create a corresponding magnetic effect. Can fire electrical energy at enemies. Used to open electrical locks via passwords. Capable of overloading security locks using ultrasound frequencies. It's a harpoon. You perv. One-way one-shot black hole teleporter?!?!?!? Other than Lex Luther; owns more Kryptonite (of multiple colors) than any other human on Earth. This includes an artificial Red Kryptonite that overloads Superman's powers by making his skin transparent; making him absorb too much sunlight. Created nanobots to brainwash Wonder Woman into fighting until exhaustion. Created artificial red sunlight or mini suns to fight Superman. Created a poison that makes Martian Manhunter's skin flammable (by covering the skin with magnesium); exploiting his weakness to fire even when he's underwater. Liquid-nitrogen to shatter Plastic Man. 'Vibration bullet' that gives Flash seizures to counter his vibrations. A bomb that staples onto Flash and detonates if he slows down (making him eventually die of exhaustion, in theory). Batman even deduced how to defeat himself; exploit Batman's obsession and trauma regarding his parents. In the event that his secret identity is revealed, Batman devised a "Knightfall" protocol to be carried out once Gotham was deemed safe. Various models throughout the decades. Has various guns and explosives on it (though Batman avoids killing). Hidden within some versions of the Batmobile; being used if the Batmobile is damaged. Spinning front wheel gives the bike extra mobility with tight turns. Contains Shark-Repellant as well as Barracuda, Whale and Manta-Ray Repellents. Outsmarted Brainiac, Lex Luthor, Superman, Joker, and many criminal masterminds on multiple occasions. Solved every riddle presented to him by The Riddler. Solved Numerous Unsolvable Crimes: granting him the title of being the greatest detective in all of DC comics. Deduced that the Green Lantern ring works on concentration despite just encountering Hal Jordan. Was chosen to (temporarily) be the God of Knowledge. Have devised a series of back-up plans in case of certain events ranging from a rogue Justice League member to Wayne Manor's "Knightfall" self-destruct sequence should his identity become public knowledge and he needs to fake his death. Frequently defeats the immortal Solomon Grundy. Has escaped Arkham Asylum on multiple occasions, including when it is overrun with supervillains. Despite his lack of powers; Batman is a master of terror and fear. He has made every member of his Rouges Gallery be afraid of him at least once; even those who specialize in (Scarecrow) or are resistant to fear (Joker, Bane). Dodges bullets from the deadliest gunmen on Earth; including Deadshot and Deathstroke. Mastered 157 martial arts known to man. Developed a working biological serum in literally four minutes. Has on multiple occasions infultrated Gotham when it was taken over by supervillains; sometimes without needing his Bat gear. Is stealthy enough to sneak away from Superman, despite Superman's absurd super-senses. It is very good faking heart failures. Even Superman was fooled, again despite his senses. Forbes Magazine declared Batman to have a net-worth of $9.2 Billion: making him the second richest non-political comic book character (behind Ironman) . Superman himself labeled Batman as the "the most dangerous man alive"
As The Batman who Laughs, was able to kill the Justice League and everybody that stood against him in his world. As Batman The Devastator, was able to defeat and kill the Superman of Earth -1. 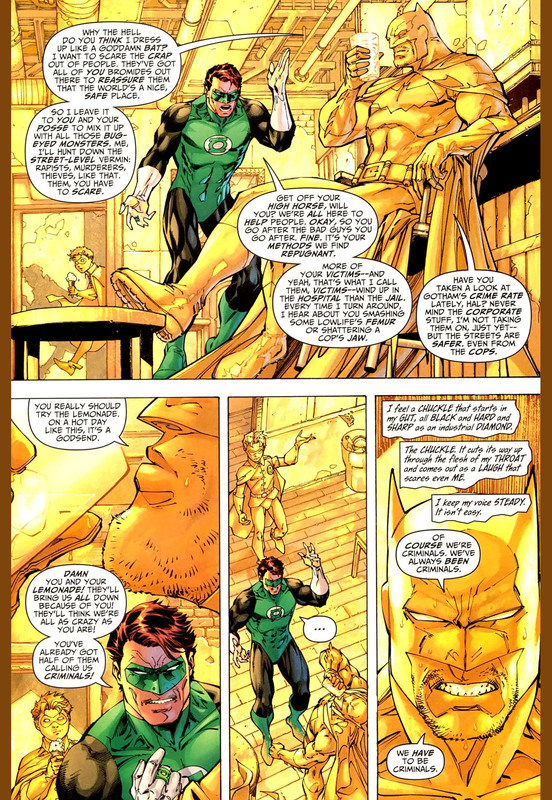 As Batman The Dawnbreaker, was able to defeat and kill the Green Lantern Corps of Earth -32. As Batman the Red Death, he was able to kill his rogue’s gallery of Earth -52, capture the Flash of Earth -52, and presumably kill his Flash’s rogues gallery. As Batman The Murder Machine, was able to defeat the Justice League of Earth -44 and kill Cyborg. Armor is lightweight and so has clear limitations. Majority of his weapons are specifically designed to be non-lethal. Barely keeps his mental stability in check due to witnessing his parents die. Overly obsessive with 'Bat Themes'. Becomes aggressive and bloodthirsty when he gains super powers. Is inconsistent with his 'no killing' rule and recently with his 'no guns' rule. Golden-Age Batman was incredibly violent; in his first appearance, he punched a man into a tank of acid with no regrets. Has nearly killed Joker on multiple occasions. Batman admits that allowing his villains to live probably is doing more harm than good. Batman admits that his mental instability is so severe that he fears turning into a Punisher-esque serial killer if he breaks his 'no killing rule', as seen with the Dark Knights of the Negative Multiverse. Some guilt over Jason Todd's apparent death and return as the Red Hood. Won't kill somebody if their mom is named Martha, even if he's been training to kill them and making special weapons for a long time. Shark Repellent doesn't work or apply in 99.99% of the situations that he's in. Highly paranoid and distrustful of others even if they are allies. Least trusted and trusting member of the Justice League; sometimes leaving the group entirely. Normally requires weakness exploitation or traps to defeat superhumans. Has frequently been cornered and sometimes defeated by Gotham villains; the majority of whom have little to no actual powers. Most other heroes that he has defeated were able to defeat Batman in other match ups. Superman destroyed the Justice Buster: despite the machine exploiting Superman's weakness to red sunlight radiation. Overpowered the Mutant leader in his old age and inspired his followers to become the Sons of Batman. Tricked Superman into thinking he died from a heart attack. Stealth and mobility skills have faded with his age. Beat Joe Chill to death after he shot his son, Bruce dead. Relayed a letter to his son, Bruce via Flash before he died with his reality. Killed all of Batman's Post-Crisis Rogues Gallery in one go at the cost of his own life. Survived the night of his supposed "death". Disowned by his own son once he was discovered to have killed Joe Chill. Survived for 5 years as the main opposition to Superman's Regime. Allowed himself to be the new host of Etrigan to trap Superman in a blissful dream. Bargained with Ares to involve the Gods of Olympus in their struggle. (Absolute Justice Ending): Overpowered Superman with the Mark-11 Kryptonite suit and banished him to the Phantom Zone. Killed the Bat-Family and then the Justice League of Earth -22. Slaughtered everybody on his world (implied to even killed beings like the Spectre). Superior to Batman of Prime Earth. Is still human, and can be caught off guard by people like Batman and Joker of Prime Earth. Since he is in the dark multiverse, he can be affected by Nth Metal. Sanity destroyed by Joker of Earth -22 (although this is more like a good thing for him). Ares’ War helmet amplified powers a hundred fold. Able to kill his world’s Ares and Wonder Woman (although for the latter she had just been stunned by one of Ares’ attacks). Killed various heroes and villains in Earth -12. Ares’ Helmet corrupted his mind. Since he is part of the Dark Multiverse, Nth Metal is able to hurt him. Doomsday Virus strengthened his durability, speed, strength, and destructive capabilities significantly. Managed to defeat several Justice League members and throw Lobo to the sun. Like other Dark Knights, almost engulfed the multiverse in darkness. The Doomsday Virus has diminished his intelligence. He is weak to Nth Metal, just like the other Dark Knights. Defeated by Superman of Prime Earth. It is high enough to corrupt a Green Lantern Ring. Slaughtered his Rogues gallery and the Green Lantern Corp of Earth -32 with ease. Overpowered Hal Jordan with ease. Prefers fighting in the water rather than on land. Killed by Aquaman when he was wearing Nth Metal Armor. Shares conscience with the Earth -52 Flash after driving themselves into the Speed Force. Positive and Dark Energy (From the Batman Who Laughs) was able to kill the Red Death. Slaughtered most (if not all) of his Rogues gallery on Earth -44. Was also able to defeat (and possibly kill) the Justice League of Earth -44, as well as decapitate Cyborg on his Earth. There appears to be no limit to how many Alfred Protocols it can create. Body armor is made of metal, making most attacks (especially Prime Earth's Cyborg) useless. Able to hack his way into the Watchtower. Still broods over the death of Alfred on his world. Was defeated (and possibly killed) by the Justice League of Prime Earth equipped with Nth Metal. Batman as he appears in Injustice: Gods Among Us. Ben Affleck as Bruce Wayne/Batman. Bruce Wayne likes Sailor Moon?! Batman can not die, because it is the goddamn batman. Your worst fear and at the same time, his greatest trauma. Will need only a few centimeters so they call him "Dead Knight"
Young Batman from the Justice League Unlimited episode, Kid Stuff. Golden Age Batman was willing to kill and use guns. Batman is the second Death Battle combatant to return twice after Leonardo. Batman is the first Death Battle combatant to return three times. Dark Claw is literally a Batman-Wolverine fusion. Behind T'challa at $90.7 trillion and Tony Stark at $12.4 billion, Bruce Wayne has the third highest net worth of any superhero with $9.2 billion.